Mother’s Day is May 9 – Bake homemade goodies just for her! It’s hard to believe Mother’s Day is just a little over a week away! Don’t forget to show your mom or special women in your life how much you care with homemade treats made by you! We have several great baking and decorating ideas in our HOW-TO section of our website. The cupcakes featured above are perfect for the tea-loving mom, complete with wire teacup holder that she can use afterwards for decoration (or for storing tea bags)! See many more ideas for baking, decorating and creating at fancyflours.com. Mother’s Day is May 9th! Mother’s Day is May 10th; just around the corner! 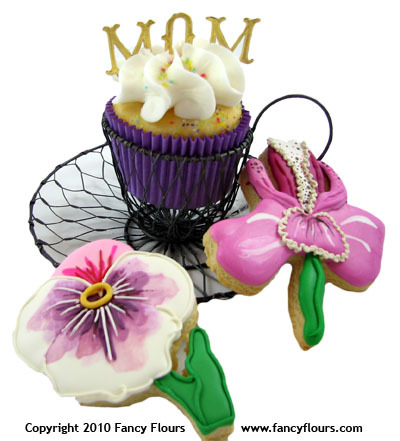 Celebrate Mom in style with a cupcake tea party! These fabulous wire cup and saucers are the perfect way to display your cupcakes. Dressed in a lavender cupcake wrap and topped with paper-craft letters – Mom is sure to be impressed! We used 1″ gold scrapbooking letters available at your local craft store. Lavender Cupcake Wraps, Wire Cup and Saucer and Flower Cookie Cutters all available at fancyflours.com.